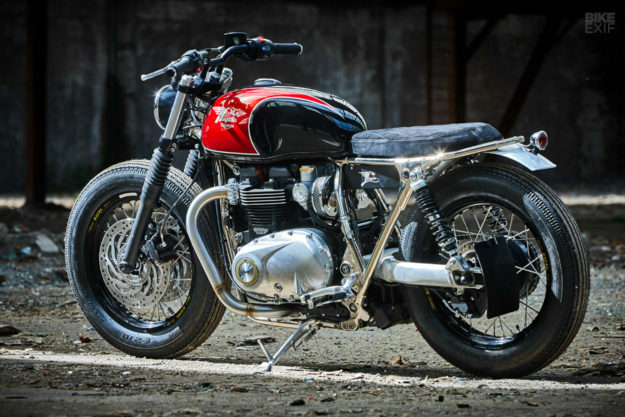 Custom builders must breathe a sigh of relief when a customer drops off a brand new bike. 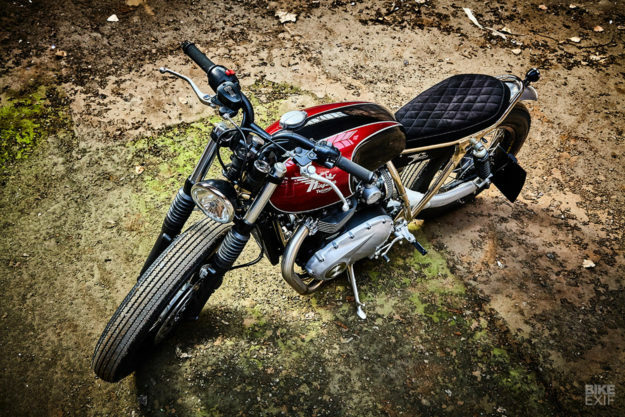 Sure, old motorcycles are simpler to work on, but with fresh metal there’s no shady past to worry about—and no fear of gremlins lurking under the surface. It’s a great time to be buying modern retros too. Just look at all the goodness that poured out of EICMA this year. The big brands are filling showrooms with modern classics that don’t just look pretty, but actually perform really well too—like the new generation Triumph Thruxton. The top of the line Thruxton R gets all the engineering love, with upgraded brakes and suspension. 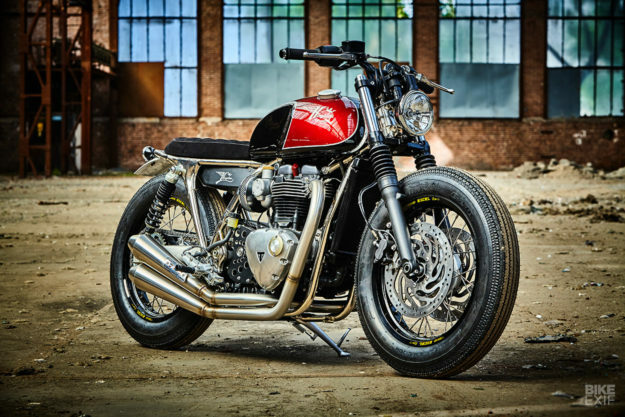 But even the ‘standard’ Thruxton is a catch—offering up 97 hp and 112 Nm in exquisite style. 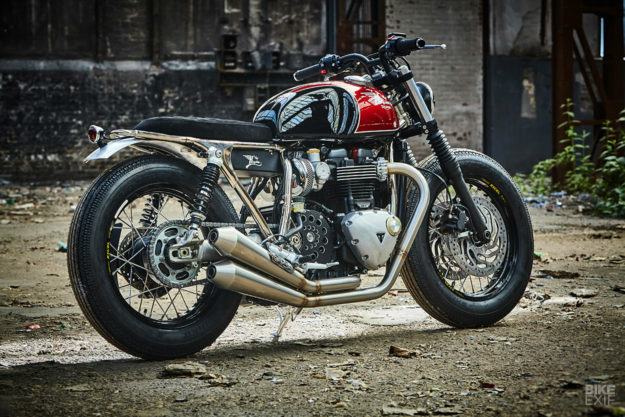 So Dirk Oehlerking of Kingstom Custom was smiling when his customer handed over a fresh Thruxton, and told him to do whatever he wanted. Dirk’s had a storied career, starting with his first motocross race where he snuck out, borrowed a Yamaha and took home the winner’s trophy. Since then he’s been German motocross champion, represented his country at world cup level, worked in a luxury car restoration shop and opened his own Yamaha dealership. 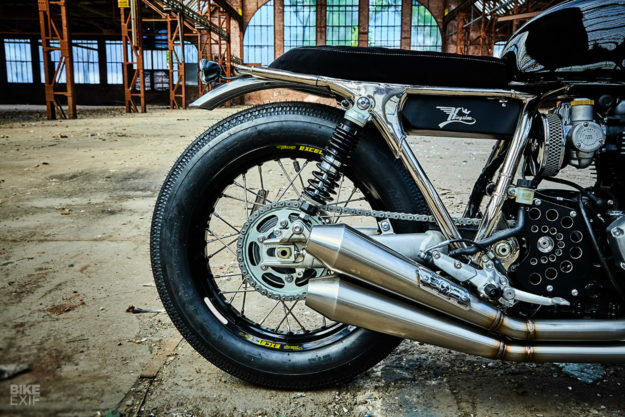 In 2010 a friend convinced him to build two Yamaha SR500 café racers. 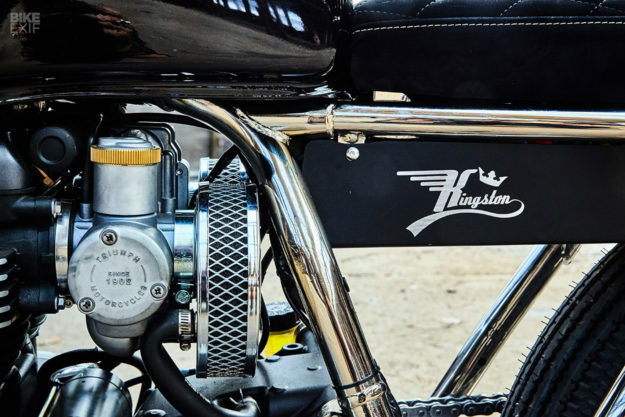 Two years later he ditched the nine-to-five and launched Kingston Custom as a one-man custom powerhouse, based in Germany’s Rhine-Ruhr region. 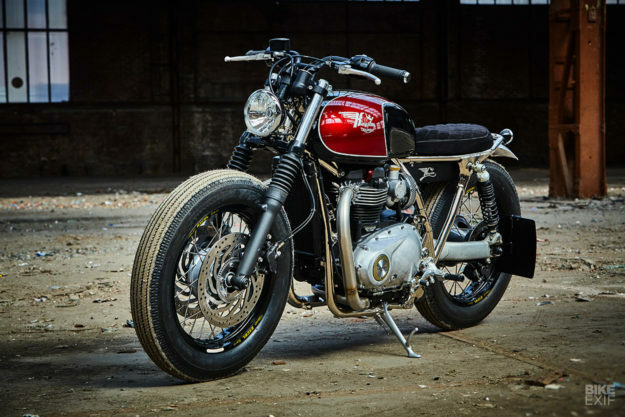 Here, Dirk took inspiration from Go Takamine’s influential ‘Brat Style.’ It’s a look that we’ve seen on previous generation Triumphs before, but Dirk’s now made it work just as well on the newer Thruxton. The seat’s a more obvious change. Dirk swapped the original for a skinny custom-made unit, upholstered in Alcantara with contrast stitching. The rear’s finished off with a small fender and a Bates-style tail light. Lower down, Dirk ditched the stock side covers, air box and wiring setup, and installed a new, custom-built electronics tray. He had to switch to a smaller Lithium-ion battery—and perform some extensive rewiring—to pack everything in there. The Thruxton still retains its ABS and traction control features, but Dirk’s managed to switch the speedo to a smaller unit. We’ve heard the new generation Triumph classics won’t run without their stock clocks, so we asked Dirk how he got around it. “It’s my secret,” is all we got out of him. 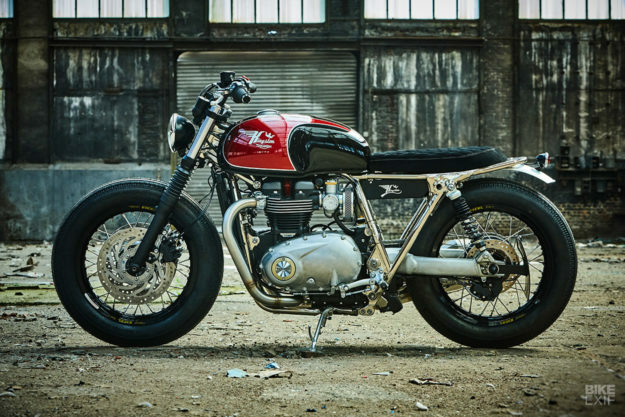 The Thruxton’s stance has been radically reworked too. There’s a new set of YSS shocks out back, and the front forks have been dropped a touch with new internal stoppers. Both wheels have been re-laced with Excel hoops, and jump up a size up from 17 to 18 inches. They’re now wrapped in Shinko 270 Super Classic rubber with a classic tread pattern. Up top, Dirk fabricated a set of direct-mount T-bars, attaching them to an ABM top triple. 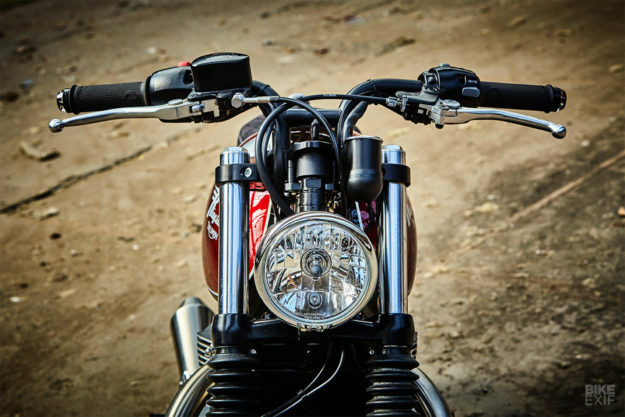 The grips are from LSL, and the bar-end turn signals are Motogadget items. Other add-ons include a Bates-style headlight, LSL foot pegs and a drilled-out sprocket cover. But there’s one stealthy mod that’s had a surprisingly big impact: the frame. Even though Dirk was working with a brand new Thruxton, he stripped it all the way down so that he could have the frame nickel-plated. The effect is show stopping, especially when paired with that high-gloss paint job on the tank. 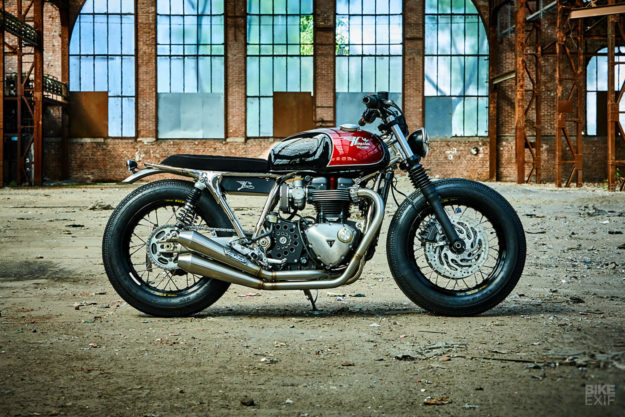 “The classic Triumph finish fits perfectly here,” says Dirk, and we agree. With all the Thruxton’s performance lurking under the hood, this should make for one fun sleeper.